We all know Thanksgiving is the perfect time to reflect on and appreciate everything we’re grateful for. I’m challenging you to make gratitude a daily positive habit you practice every day of the year, not just on Thanksgiving! Did you know expressing gratitude is strongly associated with higher overall happiness? One of the things that I am personally grateful for are all the wonderful people that read my posts and videos and have made a healthy decision because of them. I’m honored to help each and every one of you reach your healthiest + happiest self! It’s pretty obvious that “Thanksgiving” and “healthy” are not commonly used in the same sentence. After all, it is a holiday where you’re expected to spend the afternoon eating so much food until you’re so full you can’t move. Today I am breaking the Thanksgiving stereotype and compiled recipes to help you and your loved ones stay healthy this holiday! Almost everyone has family members with food allergies, high cholesterol, diabetes, or just has some family members who would prefer healthy options. The recipes I’ve compiled are delicious and can be enjoyed by (almost) anyone with different dietary needs. All the recipes below are vegan and gluten-free. As a bonus–no one would ever suspect these are healthy! 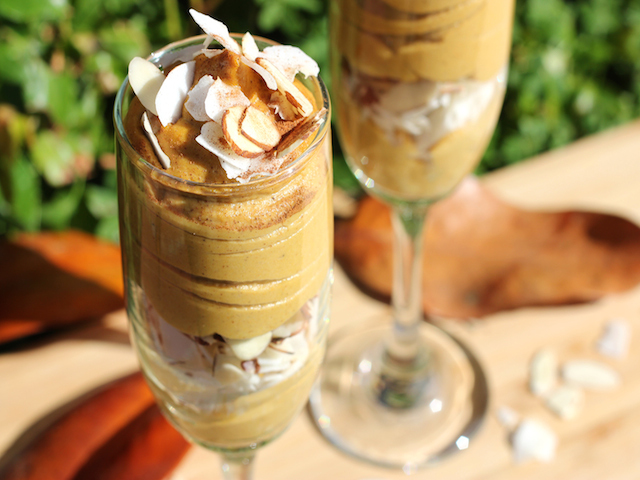 Here is one of my own festive fall recipes, “Pumpkin Cheesecake Parfaits,” pictured above! Layer the pumpkin cheesecake filling in pretty glasses with layers of flaked coconut, cinnamon, and sliced almonds. More details and the health benefits of this recipe can be found here. I wish you a safe, happy, and healthy Thanksgiving, surrounded by the people you love! This entry was posted in Recipes and tagged dessert, festive, gratitude, holiday, main dish, meal plan, menu, organic, recipe, side dish, thanksgiving.